One problem with the GoPro camera is that it doesn’t have a tripod socket on its bottom, so there’s no built-in way to secure the camera to a tripod. No worries. You can still mount it with a special accessory that attaches to your GoPro and provides a standard tripod socket. This accessory also has a quick-release mount that allows you to move the camera conveniently between shots and locations. 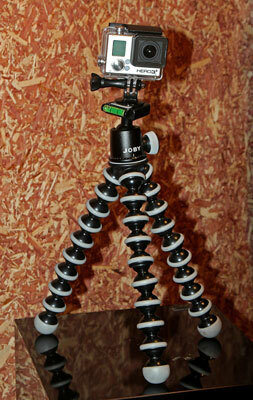 The GoPro looks comfortable when mounted on a flexible GorillaPod, for example. Tripod adapter connects a GoPro to your three-legged friend. For a good part of the camera’s 200-year history, the tripod has been the photographer’s best friend when it comes to keeping the camera steady and composing the scene. For almost as long, cameras have had a standard socket for attaching to a tripod. Yep, the three-legged amigo has made all the difference between crisply shot movies and a shaky mess.